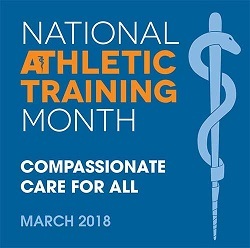 March is National Athletic Training Month, a time established to spread awareness and the importance of athletic trainers. The National Athletic Trainers Association (NATA) was established in 1950 and sets professional standards and appropriate professional recognition for athletic trainers and to date, has a global membership of 30,000. Athletic trainers function as an integral part of sports programs from secondary schools through professional sports programs. They are trained to cover injury and illness prevention, wellness promotion and examination, assessment and diagnosis, immediate and emergency care, therapeutic intervention healthcare administration and professional responsibility. Their slogan “compassionate care for all” embodies what the role of the athletic trainer should be and Marshall County is lucky to have someone on the side lines for their athletes who fits that description. 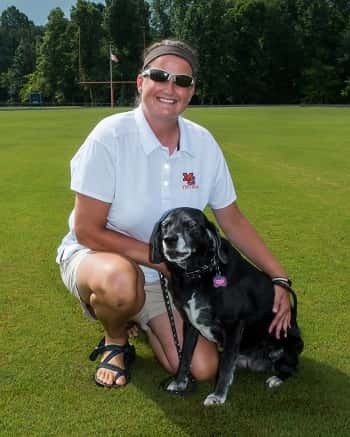 Jen Salmon is in her second year as the Athletic Trainer at Marshall County and has been a trainer for 14 years. She earned her Bachelor of Science at Eureka College in Illinois with a minor in Business and earned her Masters in Sports Fitness and Sports Psychology from the United States Sports Academy and also holds a Physical Therapy Assistant degree. Sports has been a part of Salmon’s life for a long time. In high school she was on the basketball and volleyball teams and continued to play basketball in college. “I have known Jen for a long time… and have worked with her in multiple schools”, Marshals Basketball Head Coach Terry Birdsong said. “I have always found her to be very knowledgeable in her profession and someone we can really rely on daily. She manages kids and injuries well… comforting them and helping them when they need her, but not making them dependent on her every time they get a bump or bruise.” Birdsong added that Jen is a very good communicator, keeping the coaches informed on each injury and provides each athlete with appropriate ways to get back on the court sooner. Salmon said she enjoys working with the kids, coaches, administrators and parents in her position as athletic trainer at Marshall County. She added that being able to bring her 11 1/2 year old lab/beagle mix companion Addey to work also means a lot to her.